Once an heirloom piece to be passed on from one generation to the next, the Pashmina Shawl today, has donned a new avatar. As Indian designers are rediscovering this artisanal craft from the Himalayas and giving it a modern twist in terms of blending it with silks and giving them structure and silhouette by turning them into open shawls, stoles and jackets even, there still are a large number of puritans who advocate for the traditional hand spun, hand woven fine ‘cashmere’ shawls from the valleys of Kashmir. Even the word cashmere itself can be traced back to Kashmir, for the word that has come to mean fine wool is but a western adaptation of the name Kashmir, the land that it comes from. What is Pashmina? What sets it apart from Cashmere? Both pashmina and cashmere wool come from mountain goats. But sets Pashmina apart from Cashmere is that it is much finer and makes for lighter fabric when woven. While the cashmere fibre can be anywhere between fifteen to nineteen microns thick, the ultra fine pashmina fibre is only about twelve microns or slightly more. This is also the reason why pashmina needs to be hand processed, for it is too delicate to survive the power loom or any machine. Even the fleece that goes into crafting a ‘real’ pashmina is either that is naturally shed or hand combed, it cannot be sheared as is the case with the regular cashmere wool. This extraordinarily fine wool that goes into the making of the luxurious Pashmina comes from different breeds of Himalayan goat that are found in the Changthang and Kargil regions of Kashmir and in pockets of Himachal Pradesh, Nepal and Tibet. 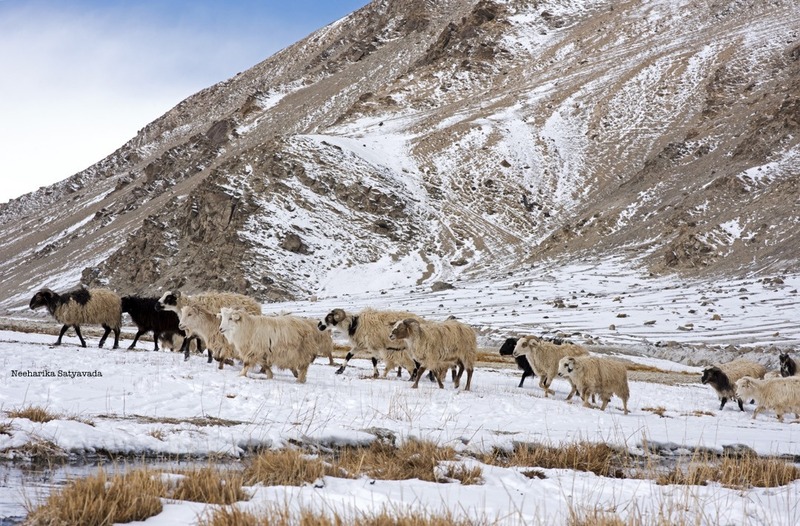 Though cashmere even comes from regions in Mongolia, it is the wool from the Kashmir Pashmina Goat – locally known as the Changthangi or Changra – which is finer, lighter, softer and three times more warmer than regular sheep’s wool that is considered to be the finest. And, it is this that goes into crafting the most exquisite and expensive Pashmina shawls. A Changpa kid returns with his family’s Pashmina Goat and sheep to his encampment in Changthang, Ladakh, as day fades. It is the Changpas, a semi nomadic people of Ladakh and Tibet who traverse the Changthang Valley, that have traditionally reared these Pashmina Goats (so, the name Changthangi) and continue to do so even today. These nomadic tribes who follow the same migratory routes in Ladakh every year, bring their livestock to the same seasonal pastures every year, settle in semi permanent encampments in Changthang for the four harsh months of winter, an important season for them, for this is when the undercoat – which is to eventually become the pashmina wool – grows. The pashmina goats have a double layer of fleece and it is their warm undercoat near the neck that is spun into the yarn that goes into a pashmina shawl. In spring, which is the moulting season, these goats shed their winter coats and this naturally shed fleece from the thick, warm undercoat is collected and hand processed. This involves combing the raw wool to remove the goat’s overcoat which is the coarser guard hair and other impurities and then washing, dyeing and spinning it into clean yarn. True to its name ‘Pashmina’ – which can be roughly translated from Kashmiri to mean Soft Gold – an authentic Pashmina Shawl flows lightly through your hands like spun velvety gold. The most elaborate of these handmade Kashmiri Pashmina Shawls is the Kani Shawl, which comes from the artisan village of Kanihama in the Kashmir valley. The Kani Shawl even received the protection of a Geographical Indication Tag a decade ago. This star of Kashmiri Craftsmanship commands pride of place in the museums of the world, from the MOMA in New York to the Louvre in Paris, where a portrait of the French Empress Josephine in a Kani Shawl is on display. These intricate Kani Shawls come in two styles. One the Jamawar which is covered all over in exquisite embroidery. The other which is the Palldar, the more minimal of the two, with only a patterned border. Designs include signature patterns of paisleys, creepers, flowers and vases that are typical of a traditional Kashmiri design in pastel hues. It takes anywhere between a year to two tears to create a full length Jamawar Kani Shawl, while the Palldar can usually be completed in two to three months. Little surprise then if this work of high art finds a place in a woman’s heart and wardrobe as a statement luxury piece. Modern methods though, have brought pashmina shawls and stoles within the reach of many. But this easily accessible, widely available pashmina is like a first copy of a genuine pashmina. What goes into making these devalued “impure” variants starts right from the raw wool that goes into it. Synthetic fibres are added to the cashmere fibres to strengthen them just enough to be able to weave them on a power loom and once the shawl is ready, it is given an acid wash that melts aways the unnatural adulterant leaving behind only the natural pashmina in the fabric. That in itself is enough to bring down the quality of the shawl; not considering the thread count, the fineness of the pashmina fibre, the softness that comes from weaving by hand on a hand loom and the craftsmanship of a master artisan. And, it is these power looms that are quickening not just the production of pashmina shawls but are also hastening the demise of a time endured craft loving kept alive by generations of traditional Kashmiri artisans. It is a combination of this lyrical skill of the traditional craftsman and the rarity of procuring pure and authentic pashmina wool that decides the price tag on a pashmina. Production of pashmina still remains true to its roots in Kashmir. With the city of Srinagar in Jammu and Kashmir being one of the major centre where raw wool from Ladakh is processed and woven by hand into the shawls and stoles that go out into the world.